Product #17247 | SKU PR-C3B | 0.0 (no ratings yet) Thanks for your rating! 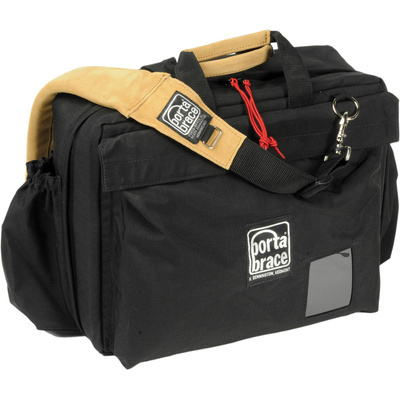 The Porta Brace PR-C3B Projector Case (Black) is a durable bag that makes it easy and comfortable to transport your projector. Made of tough 1000-denier Cordura nylon, this case is built to last. There's plenty of padding to protect your projector from potential travel-related damage. The case also features pockets for cables and accessories. It can hold a laptop under 43.9 cm. The PR-C3B opens flat, so setting up your projector is as simple as unzipping the case and plugging it in! Tie-down straps keep your projector secure when in use, while a comfortable, padded suede leather shoulder strap and suede handles makes it easy to carry. Opens flat, so setting up your projector is as simple as unzipping the case and plugging it in!